LAYDEEZ 'N' GENNELMEN! On yer left, John Alexander Dowie, weighing in at 162 pounds with robes! On yer right, Mirza Ghulam Ahmad, a trim 158 with turban wrapped tight! Watch them in a prayer duel to the death! Mixed Martial Arts ain't got nuthin' on them! As Dowie was an enemy of all religions but his own, it is not surprising he had no use for Islam — although the extent of his animus remains a point of controversy among various Muslim sects even today. In the summer of 1903, this brought a well-publicized challenge to an Islamic prayer duel to the death, or Mubahila, from the Indian subcontinent: "Whether the God of Muhammadans or the God of Dowie is the true God, may be settled...he should choose me as his opponent and pray to God that of us two, whoever is the liar may perish first.... I am an old man of 66 years and Dr. Dowie is eleven years younger; therefore on grounds of age he need not have any apprehension.... If the self-made deity of Dr. Dowie has any power, he shall certainly allow him to appear against me and procure my destruction in his lifetime." 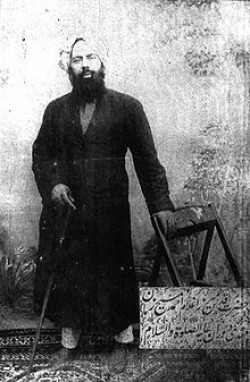 Dowie's Punjabi challenger, Mirza Ghulam Ahmad, was a remarkably well-matched opponent: he too had founded his own sect, Ahmadiyya, and believed himself a reincarnated prophet — in his case, Hazrat Eisa Ibne Maryam (a.k.a. Jesus Christ). 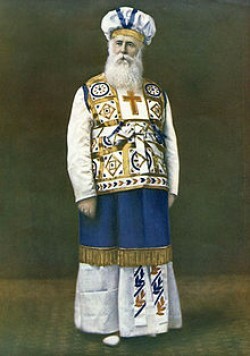 Whether the Almighty took any interest in their contest, its rules leave no doubt about the winner: in short order Dowie was deposed (amid rumors of sexual and financial malfeasance); suffered a stroke; and, in 1907, died — a year before Ahmad. So when do we get the WU Church(religion) created ? Paul, Alex ???!!! Who has a good idea for what it would be called etc ? Taking my inspiration from Magritte, I'd like to start a religion called "This is not a religion." We'd worship a god called "This is not a God". I'm a member of the Church Of The Subgenius myself. I like my slack. All Hail Bob Dobbs or the Stark Fist Of Removal will find you! Yeah we had it all figured out, BD and I. Tax exempt and some sort of sexual rites. But it is still in the developmental stage. The All Mightily Inspired Church of the Weirdly Wandering Waifs of WUvia. And having no prior reference to our universal father and creator, the almighty Flying Spaghetti Monster in this thread, it perhaps befalleth upon me to remind ye that it is only by His holy grace that we gather together here, today, to peruse such fathomless foolishness as to question the existence of His ever-loving presence and influence in our daily mortal lives. May His noodley appendage truly touch thy life today, sinner, and call thee back unto the fold of His ever-loving flock. Amen.